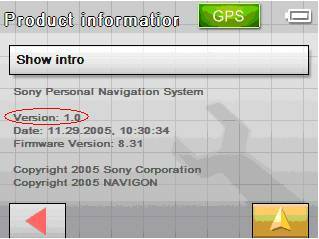 NV-U50/U50T/U70T Personal Navigation System with software version 1.0 or 1.01 or 1.02 or 1.03 or 1.04. For Personal Navigation Devices with Spanish setup, the management of TMC data is improved. In certain regions, TMC information may not be displayed correctly. Under certain circumstances, an error message may appear after receiving TMC information. Prevents occasional slow functionality under the circumstance of switching from Menu to map or additional signpost display, when Map Style and Brightness are set to Auto. The management of TMC data is improved. Software update version 1.01 (released on 27th January 2006): The accuracy of the guidance to places saved in My Favourites and in Recent destinations is improved. Touch the display to enter the top menu. Touch Settings, and then scroll down and touch Product Information. The Product information display appears. If the software version is 1.0 or 1.01 or 1.02 or 1.03 or 1.04, please update with the latest version. You must be logged on as an administrator (for Microsoft Windows 2000 and XP). Create the following folder on the C drive: nav_update. You must accept the terms of the End User License Agreement below. Then, click Download. A window will pop up. Click the Download it link. When the download is complete, check that the file is correctly downloaded: Update.exe (size is 1.22 MB (1,283,015 bytes))- If it is different, delete the file and download it again. Connect your Personal Navigation System to the power supply with the supplied AC adapter. NOTE: Make sure that you have installed Microsoft ActiveSync from the CD-ROM or the DVD-ROM that was supplied with your Personal Navigation System. If you have problems connecting your Personal Navigation System, please visit the Microsoft support website. Enter c:\nav_update\update.exe and click OK.
Click OK and disconnect your Personal Navigation System from your PC. The software version should be 1.05.